MG RX5 2018 comes with a price tag around AED 53,000 - 84,000 presently. This compact SUV is a 5-door wagon that derives its power from two powertrain options, 1.5 TC I4 and 2.0 TC I4. Fuel economy of the first engine option reads around 14.5 kmpl and the top speed touches up to 170 kmph, while the bigger engine offers 12.3 kmpl mileage and a top speed of 180 kmph. 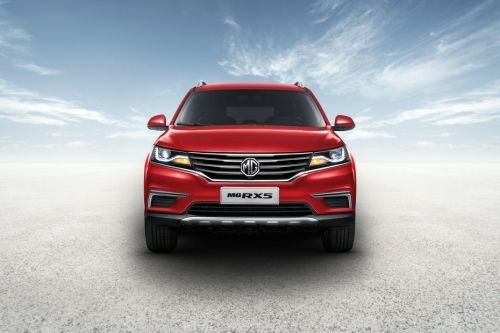 It has earned a 5-star rating in the Chinese C-NCAP crash tests. The major highlights of this vehicle are its affordability, spaciousness of the vehicle cabin and good styling. The front-wheel-drive MG RX5 comes designed with dual-tone 18-inch rims, LED headlamps, premium-quality cabin finishing, panoramic sunroof, auto-hold brake function, keyless entry and a 10.4-inch high-definition advanced infotainment system. Have a question on RX5? RX5 is available in 1 different colors - Red. MG RX5 is the British marque’s powerful offering to the Philippines. The four-wheeler arrives in two variants, namely MT Core and AT Style and has been showcased at the 2019 Manila Auto Show Expo (MIAS). RX5 inchoates the automaker’s entry into the compact crossover segment. This is a simple yet dignified car that doesn’t have much to deal with fancy outlooks but enough for the interior and the powertrain. It offers a spacious interior that offers a decent room for head and leg, thus contributing to comfort. Overall, RX5 hs a redefined built and it gives a tough competition to other crossovers in the segment. Just like the exterior, the interior also comes with a neat design. But that does not stop it to feature the latest techs and components of a high utility. The interior offers a commendable and comfortable cabin. The dashboard, door inserts, seats and most of the parts get a finishing of high-quality materials. Other features include an 8-inch infotainment display, cruise control, auto hold function, and electronic parking brakes. As said, the exterior is not the place where the manufacturer has spent much of its time. One can see the presence of well defined contoured edges that tend to differentiate every part of the vehicle. At the anterior, the car features a compact metal grille at the front with lengthy horizontal ventilation, which shares its precincts with headlamps. The LED units are illuminated by flowing daytime running lights. Below the grille, there are fog lamps with a housing with an L-shaped chrome outline. Then comes a bold bumper, which also has a broad silvery plate at its centre. The wheels are placed under broader wheel wells, which has dark bezels as its outline. There are a couple of characteristic lines on the side profile but not enough to vaunt about. While there is a minute expectation of aggressiveness at the front, the rear is a bit expressive. This can be concluded by the presence of large LED taillights that contains arrow-shaped light strips. Both the taillights are joined via a shiny line at the middle of the tailgate. Moving downwards, it carries a broad bumper with chrome skid covering, followed by dual exhaust pipes. On the part of the suspension, it equips an enhanced Macpherson suspension for the front and multi-link suspension for the rear. This will surely offer a smooth ride even on rough and bumpy roads. Thereafter, an ESP power steering with tilted column controls the 18-inch alloy wheels (in AT Style variant) and offers fair handling. The wheel size is trimmed by an inch on the MT Core variant, but rest remains the same. A 1.5-litre turbocharged gasoline engine makes its way for both the variants of RX5. The mill delivers a maximum power output of 169 PS at 5,600 rpm and a maximum torque of 250 Nm within a rev range of 1,700 - 4,400 rpm. In this case, the coaster will get a healthy power supply to provide a decent driving experience. Furthermore, the drive is delivered to the front wheels via a 7-speed double clutch transmission. Alongside a fair power, the engine will also have a competent fuel economy. An all-disc layout builds the braking system. Commendable stopping power is an obvious expectation from the brakes. The brakes are further backed by Anti-lock Braking System (ABS) and Electronic Brakeforce Distribution (EBD) that altogether enhances the braking ability of the vehicle. Safety features like stability control, traction control, driver and passenger airbag and hill-start assist are there to do the job. Moreover, the car also gets a central locking feature, safety alarm and keyless entry to eliminate theft fret and provides convenience in operation. RX 5 embodies a vivid example of clean design, great functionality, and powerful ride. The vehicle does not pursue to draw attention on cosmetics but has got a plethora of delights inside. Its interior is fairly spacious to provide room for your family and the appreciable driving dynamics makes it coast smoothly even on difficult terrains. Surely, the SUV is not something to acclaim in terms of looks but can convince someone to ingress inside and the next moment the buyer will fall in love with it. What is the price of MG RX5? On road prices of MG RX5 in starts from AED53,000 for base variant 1.5T STD, while the top spec variant 2.0T LUX costs at AED69,900 . What are the colors options available in MG RX5?